David was a man in tune to the desires of God. The Bible describes him as “a man after God’s own heart.” But even he acted against the will of God in his life and was forced to endure painful discipline as a result. In Psalm 33:8-9, God lovingly instructs David after an episode of sin, discipline, and confession. I have said before that there are three levels in our relationship with God. The first is fear, where obedience springs from an understanding of God’s power and his wrath toward sin. The second is duty, where we obey out of an understanding of God’s will for us and a sense of personal obligation to our Savior. The third is love, where we obey out of a recognition of his unconditional love toward us and a desire to return that affection. Most horses are at level one in their relationship with their riders. They have no understanding and must be controlled with a bit and bridle. The bit is uncomfortable and can be used to exert pain if the horse refuses to obey its master’s commands. 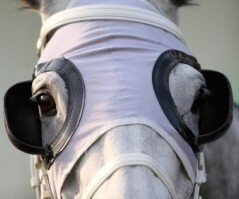 The bridle keeps the bit in place and gives the master control of the horse’s head. God does not desire this type of relationship except as a step toward closer intimacy. He wants us to draw near to him and if we resist he will pull us about by the bit, exerting pressure and pain to guide us back into his will. Some horses, however, are in tune with the will of their rider. The horse and rider relationship is so close, so familiar, that all it takes is a glance, a little shifting weight, or the pressure of a knee on the horse’s side to turn the horse. The steed becomes an extension of its master’s will. God wants this type of relationship with us. He wants to guide us with his eye. He will exert pain if necessary, but he desires a relationship so familiar that at the mere glance of his will, we immediately notice and obey. He wants us to be “people after God’s own heart.” May God help us to have a relationship this intimate! 1 Comment on "Bits and Bridles"